The year is 1944 in Budapest, Hungary and Georgio Perlasca, an Italian import-export dealer, is there on business. The war is raging but he has managed to largely avoid anything to do with it – that is until he witnesses the cruel and violent round-up of Hungarian Jews by the occupying Germans. In a major show of bravery, Perlasca audaciously rescues two boys from being herded onto a freight train in defiance of a German lieutenant colonel on the scene, who happened to be none other than Adolf Eichmann. Sacrificing his own escape, he impersonates a Spanish consul and over a period of some 45 days, from 1 December 1944 to 16 January 1945, his heroic actions save the lives of more than five thousand Jews. Forty years would pass before the world would hear the story of Perlasca’s courage and bravery, when Israel honoured him the Righteous Among Nations Award. Now his courageous journey can be witnessed in Perlasca: The Courage Of A Just Man (Perlasca: Un eroe italiano), a 2002 film made for Italian television and described by the New York Post as "A heart-rending Italian Schindler's List" and Village Voice as "More courageous than Spielberg in its depiction of Nazi brutality." Luca Zingaretti from BBC hit series Montalbano plays Georgio Perlasca, an Italian cattle dealer who found himself trapped in Budapest in 1944. With a striking score from Oscar-winning master composer Ennio Morricone, this 2002 film co-stars Jérôme Anger, Amanda Sandrelli, Franco Castellano and Marco Bonini. 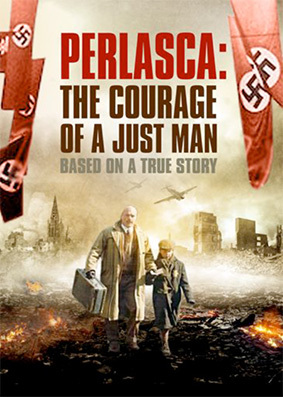 Perlasca: The Courage Of A Just Man will be released on UK DVD on 8th April 2013 by Odyssey at the RRP of £15.99.